Accommodation where Mt. Ide and shore are seen. It is on the foot Shirakawa shore side of Ide Mountain Range and can take a bath while feeling beauty of seasonal nature while being surrounded by Nature. Meal is local cuisine using products of the district ingredients. Delicacy which is recommended to raw sake to make in accommodation. 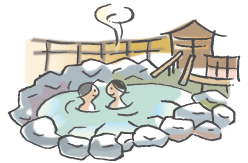 You soak in hot water called Bijin-no-Yu Hot Springs after meals, and please enjoy hot spring bath. In addition, we can enjoy sports such as camping or park golf and outdoor in Shirakawa lakefront Park of neighborhood. It became cottage three pet and dog cottage to be able to stay in 2018. ■Name Shirakawa Onsen "Shirakawa So"
※We take to and from to Yonesaka Line Tenoko Station or Uzentsubaki Station. ■Contact information Shirakawa Onsen "Shirakawa So"